I think most people will have a weird opinion of these guys. I know some people either hate them, while others love them. It's been that way since the very beginning. After various members were originally posting on the NZHondas forum, getting asked if they ‘circle jerk’ around their cars, the gang literally became Circle Jerk Crew (CJC). 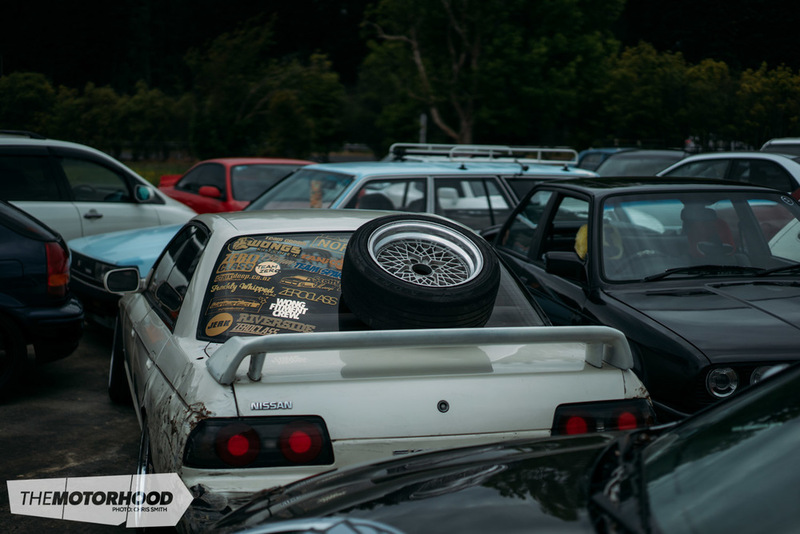 A forum, website, and club was then made, and now has become a true source of inspiration for other clubs and New Zealand car culture as a whole. For many, the car club popped up at V 4&Rotary Nationals and essentially stole the show. They went on to return for a few years, always winning awards until their departure this year. The club has got a level of notoriety to it that many may not understand or get, but the cars they produce are some of the best in the country. There's definitely a family influence going on in the club. They're a close bunch who are held down by some dedicated OG's. But this day was all about shooting these cars for the cover feature in NZ Performance Car. The problem was, we needed to shoot them all together. Naturally shooting nearly 100 cars in one shot isn't exactly easy to pull off and the only accessory to height that we had was this rickety, old scaffolding system. We had to prompt and queue everyone up to ensure everyone could fit in the shot. It's not as easy as just parking everyone in rows, we wanted a bit of a puzzle atmosphere going on, but it was never going to be as easy as our head told us it would be. It came together quickly though, with a bit of help from the gang and some careful preparation to ensure the right cars were in the right place and the right style was shown. Marcus was running around grabbing cars and putting them into place. While Ants, of Wong's Kitchen fame, was up front redirecting his gang to get in place. Photographer Adam Croy was up on top of the scaffolding with the view in sight, and keeping his eye on the shot. Everyone seemed to be standing around wishing they could get to the top platform to see what was going on. It looked cool from the ground, but a lot cooler from the top. The end result was something quite beautiful really. We had managed to arrange the cars and create the cover shot for issue 218. It's cool to see how this becomes a cover, and graces the stands in stores all around the country. I took the opportunity to do a few mini features along the way to show off everyone's cars. Here's Vash Verma's crazy 2JZGTE-powered Altezza. A lot of work has gone into this car over the years, leaving Vash with a car that seems to provide him with a love-hate relationship. Troy Griffin's JZX100 Chaser sits on Work Meisters and is featured in this month's issue (NZ Performance Car Issue No. 219) as the Daily Driven. He's had the car for a while now and has returned it back to a very clean state. Keep an eye out for it in the magazine. It wouldn't be a CJC meet without Royce's R32; a car that has become internet famous and known for Royce's aggressive drifting behind the seat of the RB20E-powered beast. There are plenty of characters in the team, and by this point we decided to pack up and grab some lunch on the way to the next site of the day. Royce had to change out his entire rear suspension strut set-up in order to take the car out drifting. Because of this, the car ended up lower, which is quite impressive considering the car is already sitting mere millimetres off the ground. Kelvin brought his Corona wagon out for a spin. It's hard to tell who's got the lower car between Royce and Kelvin but no doubt there's only millimetres in it. The Corona was seen sparking and scraping the chassis rails all evening. 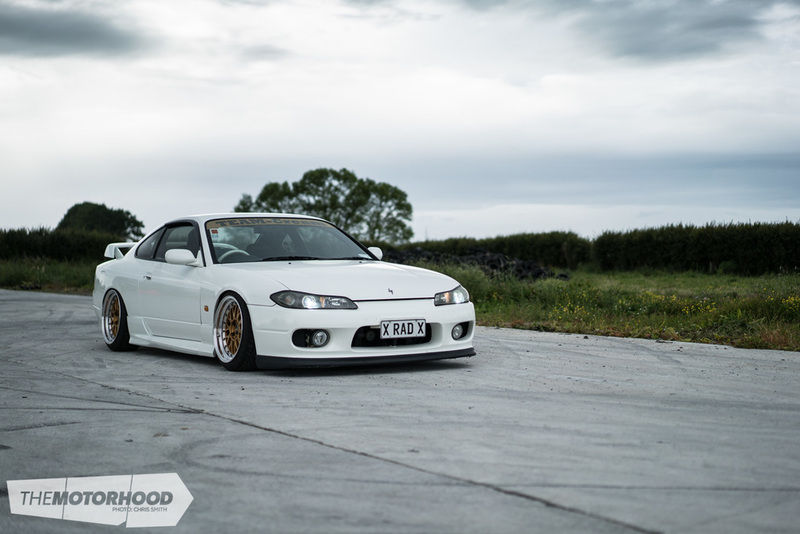 Royce's girlfriend has this S15; the car is running a set of Anthony Wong's old BBS LM that was once sitting on his (previous cover car) K20-powered EK4 Civic. You couldn't go much lower without body-dropping the whole car. I think most will agree that Royce has huge talent to be able to pedal the car like he does. I would love to see him pedalling a powerful car — no doubt a D1NZ champion in the making. Neal owns this 180SX as his somewhat ‘daily drifter’, and also has a Cefiro that's getting more and more work done to it to become what may be a competition car in future. Neal threw the 180SX onto the silage pad and brought home the smoke. Last but not least, Vash had his mate Scott take out his Altezza and give it a thrash. Nice to see this car being used hard. Check out more coverage in NZ Performance Car Issue No. 218 if you haven't already.